Why Don’t we Recognize Awake Awareness? Why Don’t we Recognize Awake Awareness? Why Don’t we Recognize Awake Awareness? When I went to India and Nepal in the 1980s I met a Tibetan teacher named Tulku Urgyen Rinpoche who freely gave out instructions for immediately recognizing awake awareness. The reason he was convinced that it was possible for us to awaken was because he had awake awareness shown to him when he was eight years old. Then after doing three 3 year retreats, he reported that awake awareness was the same, so he generously shared this with me and others. Recognizing awake awareness does not require great intellectual understanding. But simply learning how to shift out of the optical delusion of our current constellation of consciousness. 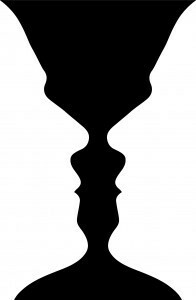 It becomes as easy as shifting back and forth between seeing the cup and the two faces in the image above. We’re so smart and our lives are so complex that it’s hard to believe that simply discovering awake awareness could be the solution to our suffering. It’s also hard to believe that the most important discovery is already here within us; we don’t have to go on an odyssey to find it, earn it, or develop it. We’re so used to knowing ourselves through our troubles, our dramas, and our obsessions that awake awareness, which is our true nature and our basic goodness, is hard to accept as our true identity. Many of us have unwittingly glimpsed awake awareness throughout our lives. In fact, we often seek its enjoyable qualities without realizing that awake awareness is their source. From our current level of mind we cannot experience our ground of Being, deep wisdom or open-hearted awareness. Although we may not have known it, whenever we experienced love and wisdom, it has always been because we shifted levels of mind. Many of us have unknowingly dropped into awake awareness while walking in nature, being creative, making love, or playing sports; some of us have experienced it through crisis that became opportunity. Although activities like nature walks are pleasurable in themselves, they also relax the dominance of ego-identification, allowing awake awareness to emerge from the background. There’s an old wisdom saying: “Silence is not the absence of sound but the absence of self.” In other words, we don’t need to go to a physically quiet place. We can experience both the deep stillness and the dancing aliveness that arise simultaneously. Silence and stillness are here now within you as you are reading this blog. Awake awareness and its natural qualities are not connected to any specific place, person, or activity — nor is awake awareness dependent on any internal thoughts or external conditions. If we try to re-create our experience by going back up that hill, our expectant state may keep us from letting go of the seeking mind long enough to allow awake awareness to be revealed again. Many of us have tried to find awake awareness. We’ve tried to earn it through good deeds, achieve it through meditation, or pray that it will be granted. Some believe that it’s available only to the highly evolved. Others believe it only appears through luck or a kind of grace that is either given to us or absent from our lives. When the obscuration of ego-identification dissolves, it can seem as if grace or awake awareness had been absent and then newly arrives from somewhere else. 1. Look out at an object in the room. Notice being aware of that object. 2. Now notice being aware of seeing. 3. Now close your eyes and feel that the same awareness that was used to look outward can now be aware of awareness. Allow awareness to be interested and aware of itself: awareness resting back to become the subject and the object. Feel awareness as intimate, soft, spacious, and pervasive. 4. Let go of interest in thoughts, sentences, ideas, or points of view. Allow your awareness to be interested completely in awareness. 5. Let the awareness rest as the awareness that already knows itself and is aware of arising experiences. 6. Notice what it is like to be aware from awareness rather than from thinking or ego-identity.